Congratulations Norm! =D Chef Brendan Prong (@chef_prong) of West50 Pourhouse & Grille (@West50Pourhouse) will be in contact with you soon via Twitter with details on how to redeem you dinner. Congrats again and I hope you will enjoy your tasting at West50 Pourhouse! I also want to say a big THANKS to the 77 contestants who participated in the giveaway! 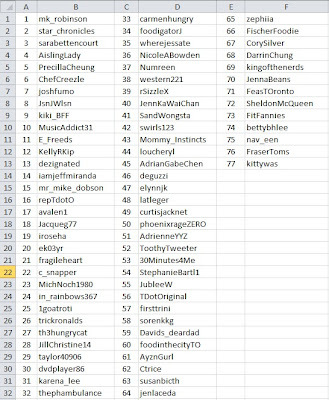 Here's a snapshot of the Excel spreadsheet where I tracked the #10courseatWEST50 stream from day one of the contest. The tracking was done using chronological order, as in, #1 was the first person who entered right the contest. To enter, the person has to tweet "I want to win a 10-COURSE TASTING MENU FOR TWO at @West50Pourhouse! http://bit.ly/KgMOBh #10courseatWEST50". 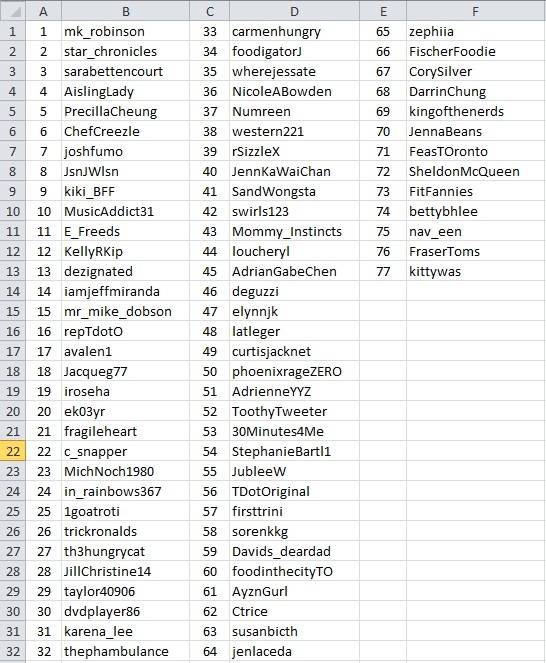 Once the contest was over and everybody's entries were accounted for in my spreadsheet, I went to check if they actually followed me on Twitter (I also sent the below list of contestants to chef Brendan Prong at West50 Pourhouse to look over). After weeding out the people that did not follow West50 Pourhouse, Chef Brendan Prong and I on Twitter, I was left with 62 contestants. 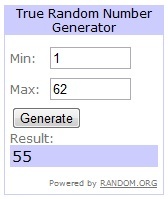 I went to "True Random Number Generator" from random.org to randomly pick a winner for me from 1 to 101.